A pyramidal tree with large, narrow, glossy dark green leaves. The late spring flowers are white and fragrant. 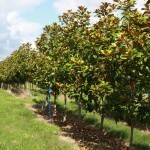 The current standard among the evergreen Magnolias for northern gardens, and considered one of the hardiest. Best grown in full sun to part shade in an organically rich, well-drained soil. The original tree was purchased from a Florida nursery in 1917.